This is a super simple recipe that is also astoundingly good. Perfect for a weeknight dinner, or if you need something simple but impressive to feed a crowd. See Notes at the bottom for a suggestion to use the leftovers in another dish. This recipe originally appeared in Why Did the Chicken Cross the Globe? 1. Combine the soy sauce, vinegar, garlic, bay leaves and peppercorns in a Dutch oven or other heavy pot with a lid and stir to combine. Add the chicken pieces, turning them in the sauce to coat them evenly. Bring to a boil over high heat, then turn the heat to medium and simmer for 30 minutes with the lid askew. 2. Remove the pot from the heat and turn on the broiler. Being careful not to tear the skin, transfer the chicken pieces to a baking sheet lined with foil, and broil about 3 inches from the heat source for about 10 minutes, with the skin side toward the flame. Watch to be sure the skin doesn't burn (if you think it’s too close, move the rack away further from the flame and continue). When finished, chicken pieces will be a deep, caramel brown. 4. When the chicken and sauce are finished, put the chicken pieces in a serving dish, cover with the sauce, and serve with rice. This dish is seriously simple, and ridiculously good. This is one of those dishes where I make twice as much as we’ll eat, so I can use the leftovers for other things, because the meat is so tasty. I created the recipe for Adobo Rice Bowls to use the chicken and leftover sauce in a lunch or one-dish dinner on another day. Adobo is a common (and delicious) cooking technique in the Philippines. You can check out my recipe series Why Did the Chicken Cross the Globe? 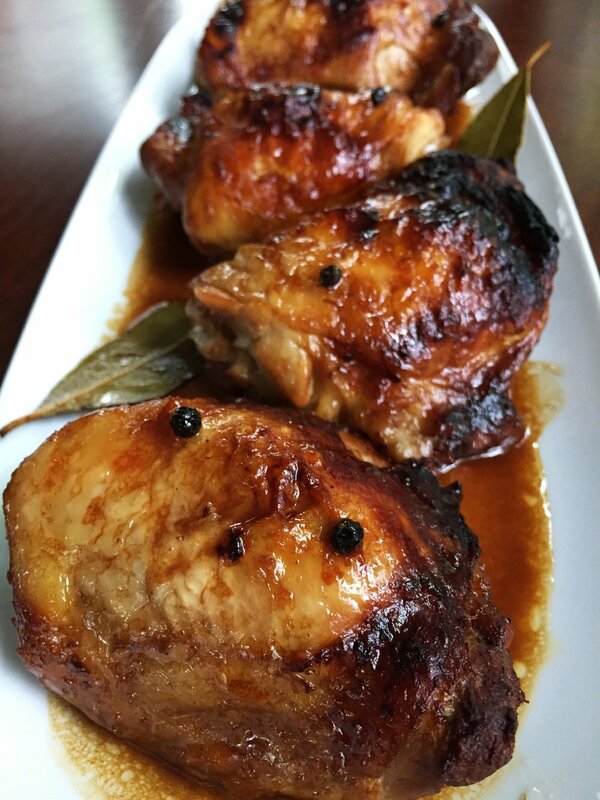 for more about chickens and adobo in the Philippines. Thank you to Isabella Breslin for the original version of this recipe, which she found in The Philippine Cookbook, by Reynaldo Alejandro.